Chet Cale has been a full time artist for over 20 years . For the last 17 years he has been working at his studio /gallery , Stone Street Arts, at 510 Stone Street, Great Bend, Kansas 67530. 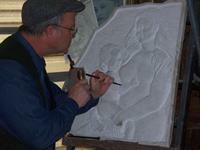 Working as a sculptor Mr. Cale has completed works in stone, bronze, clay, wood, cast stone, and plaster. Commissions include portraits of children, women and men, judges, heads of business, religious leaders, and pioneers of science. Golden Belt Veterans Memorial, Kansas Stampede Mural (45 feet by 15 feet), History of Barton County relief Mural 8 feet by 6 feet, for BtCoHistSoc, ASPIRE, a 23,000 lbs limestone installation for BCCC. I believe that the need for art is inherent in everyone. Art inspires us and consoles us, makes us laugh and makes us cry. It can resonate within us emotions that we have forgotten or never knew we had. Art reflects the history, the values, the hopes, and the fears of humanity. It is part of our nature to both express ourselves and to see, hear, read, and absorb the expressions of our fellow human beings. For some of us the desire to create art is reflected in our life’s work, and the world calls us an artist. To be a part of this communication is a privilege. To know that you have touched someone's' life in a positive and primal way is one of the greatest rewards that one could ever hope to achieve. I am thankful to have been given this desire and for the support of family, friends, and patrons to pursue it. I am the last building on the south end on the east side of Stone Street, Great Bend , Kansas.